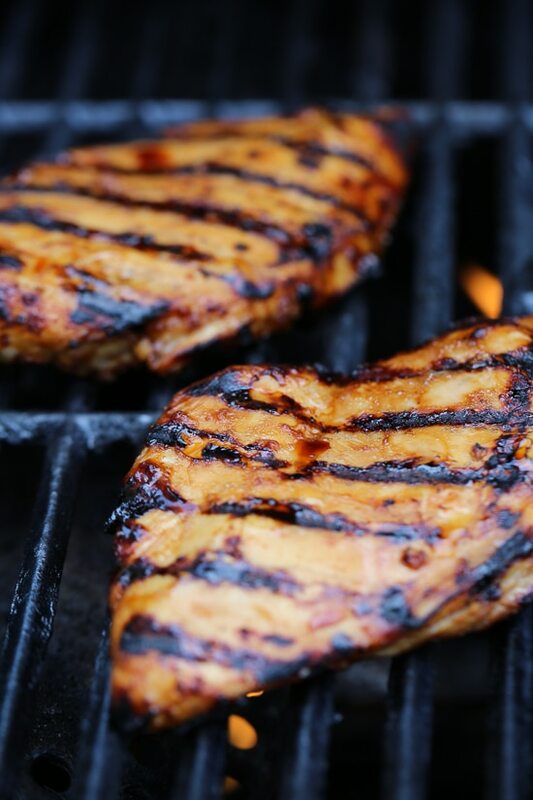 Grilled Bourbon Chicken breasts are marinaded with soy sauce, Bourbon, brown sugar, ginger and spices then grilled until slightly caramelized on the outside and juicy on the inside. 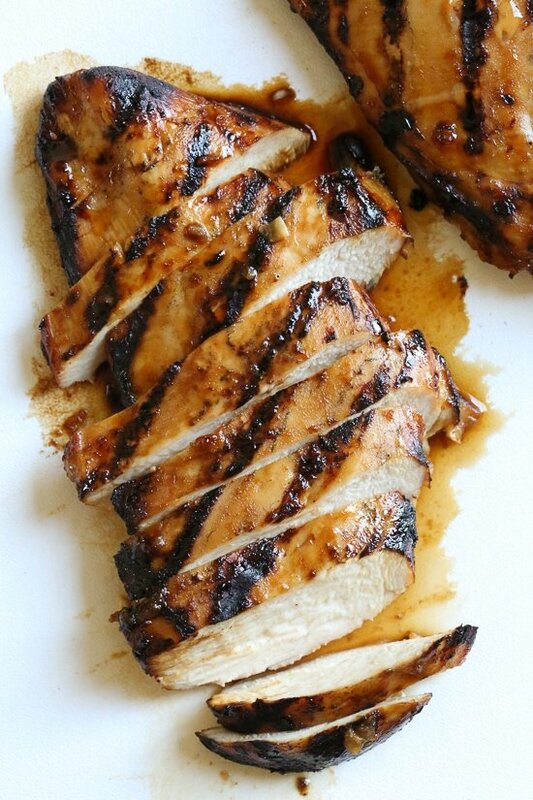 This recipe takes boring grilled chicken to a whole new level! The inspiration came from the popular mall dish, Bourbon Chicken, a dish I used to get as a teenager at my local mall’s Cajun-themed Chinese restaurant. 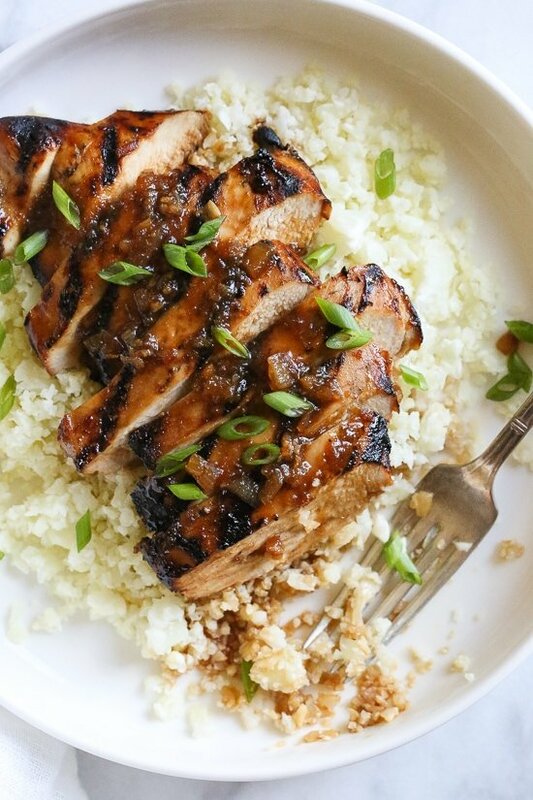 I served it over cauliflower rice, but it would also be great with brown rice. Rather than stir frying, and using all that oil and sugar they typically use in the dish, I lightened it up and made it on the grill with a lot less sugar. 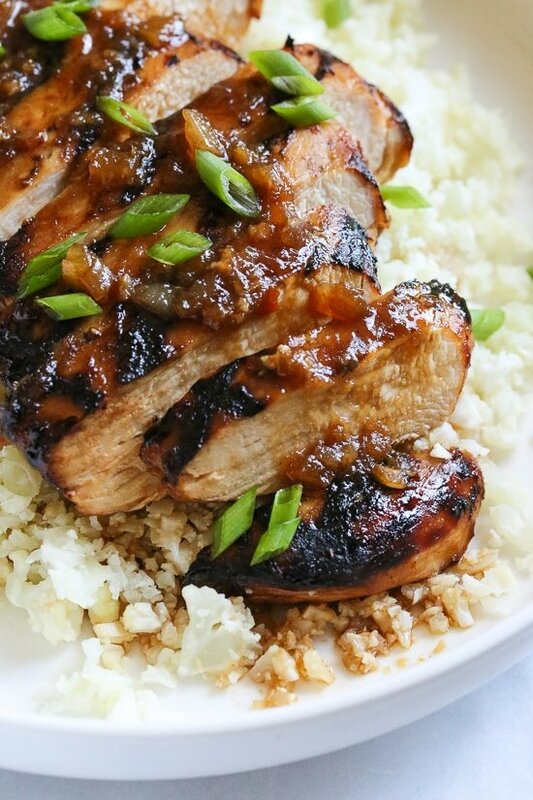 This chicken is so deliciously flavorful with hints of bourbon flavor. What kind of bourbon to use for cooking? I save my better Bourbon like Knob Creek for sipping, and use cheaper Bourbon like Jim Beam, Wild Turkey or Old Crow for cooking with. The longer it marinates the better it tastes! I marinaded it for 12 hours but you can even do it overnight. If you don’t have a gas grill, you can make this on a grill pan or under the broiler. Boneless, skinless chicken thighs would be great in place of chicken breasts. Increase the cook time to about 20 minutes, turning often if doing so. To make without alcohol you can eliminate the bourbon. Place the chicken breasts, 1 at a time, in a Ziploc bag. Pound the chicken breast to an even thickness, being careful not to puncture the bag. Put both breasts in the bag. In a medium bowl, combine the soy sauce, apple sauce, onion, ginger, garlic, oil, bourbon, BBQ sauce, vinegar, brown sugar and red pepper flakes. Reserve and refrigerate 1/3 cup of the marinade and transfer the remainder to the Ziploc bag with the chicken. Refrigerate and marinate for at least 30 minutes or as long as overnight (the longer the better!! I marinated mine 12 hours). Preheat outdoor grill over medium high heat. Discard the marinade in the bag and grill the chicken for 4 minutes per side, or until chicken is cooked through. Transfer chicken to a plate, tent with foil and allow to rest while you make the sauce. Put reserved 1/3 cup marinade in a small sauce pan. Add chicken broth and bring to a boil over medium high heat. Once boiling, reduced heat to medium-low until sauce has thickened slightly, 5 to 6 minutes. 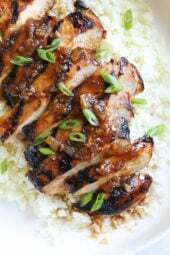 Slice chicken breast, top with sauce, scallions and serve. Nutritional info accounts for the marinade that gets tossed. Next articleThe Best Desserts are Three Desserts in One, Like These Peanut Butter Cheesecake Brownies! Tasty Food brings you all the freshest food recipes, videos, images, nutrition and news information from around the web. All content is provided as is and credited to the source.